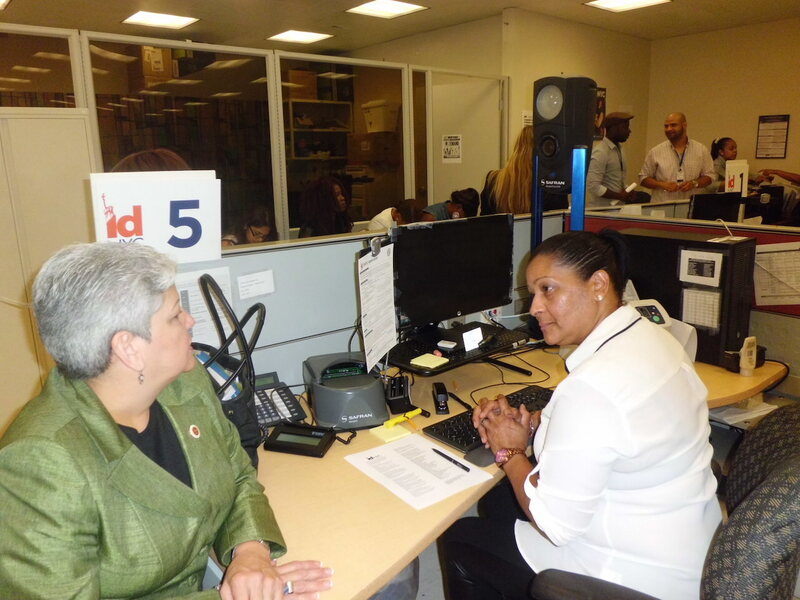 City Councilwoman Maria del Carmen Arroyo, left, signs up for an ID card at Lincoln Hospital’s IDNYC enrollment center. 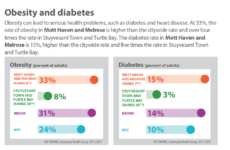 Mott Haven is at the heart of the city’s efforts to ease immigrants’ access to health care and other government services through the use of new ID cards. At a press conference outside Lincoln Medical Center on August 27 to publicize Mayor Bill de Blasio’s initiative to provide ID cards for undocumented New Yorkers, city agencies and elected officials said more than 30,000 have signed up for the IDNYC program since the enrollment center opened at the hospital in April. Two of the Bronx’s three permanent sites where immigrants can enroll to receive the card are in Mott Haven, including Lincoln. 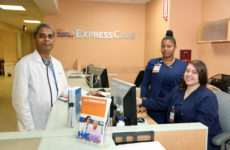 Centers have also been established at the employment office at 3030 Third Ave. at 156th Street in Melrose and the Bronx Library Center in Kingsbridge. “When it comes to health care, there are too many disparities,” said Ram Raju, president of the city’s Health and Hospitals Corporation. “It makes a lot of sense to have this program at Lincoln Hospital.” Raju added, however, that although ID cards add convenience and access, the city’s public health system mandates hospitals see every patient, with or without a card. “We don’t throw anybody away,” he said. More than 500,000 have enrolled in the program citywide, according to the Mayor’s Office of Immigrant Affairs. More than 10,000 have been served at the Third Ave. site and 19,000 at the library. In addition to the borough’s three permanent enrollment centers, the city has launched pop-up centers in areas that are harder to reach. For a full listing of IDNYC centers across the city, click on: https://idnyc.appointment-plus.com. Officials say Mott Haven was selected as a key area for the program earlier this year because of its convenience as a transportation hub and due to the large number of undocumented immigrants. 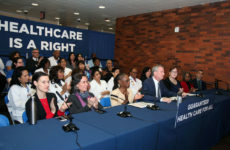 In addition to its function as an ID card for immigrants who lack other documentation, the card can be used by all New Yorkers to obtain discounts on prescription medications at city drug stores and for fitness center memberships, and to apply for health insurance through the state’s Health Marketplace, along with other perks. After the press conference, City Councilwoman Maria del Carmen Arroyo and Assemblyman Marcos Crespo signed up for their cards at Lincoln’s second floor sign-up center, citing advantages such as discounts. The enrollment process took about 15 minutes. George Rodriguez, the longtime chairman of Community Board 1, said he and other activists rallied to pressure the city to ensure access to health care for undocumented immigrants at the beginning of the 1970s. “We opened the doors,” said Rodriguez, recalling that recent arrivals from Cuba were being turned away from Lincoln at the time. Even though hospitals are now required by law to see all patients regardless of immigration status, he said, not all undocumented immigrants know that. The new ID card will help encourage them to seek the medical care they may need. “We have to make sure they are part of the society,” said Rodriguez.